Sentiment analysis seeks to identify the viewpoint(s) underlying a text span; an example application is classifying a movie review as "thumbs up" or "thumbs down". 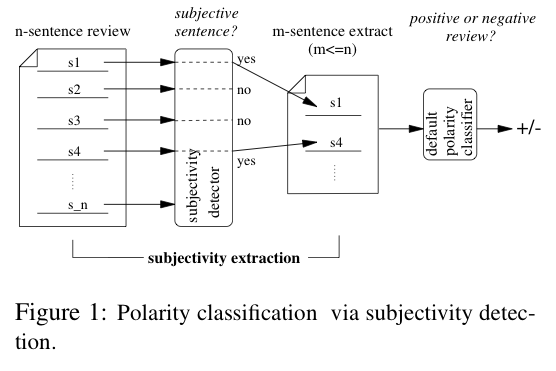 To determine this sentiment polarity, we propose a novel machine-learning method that applies text-categorization techniques to just the subjective portions of the document. Extracting these portions can be implemented using efficient techniques for finding minimum cuts in graphs; this greatly facilitates incorporation of cross-sentence contextual constraints. Software sorts out subjectivity. Technology Research News, November 17/24, 2004. This paper is based upon work supported in part by the National Science Foundation under grants ITR/IM IIS-0081334 and IIS-0329064, a Cornell Graduate Fellowship in Cognitive Studies, and by an Alfred P. Sloan Research Fellowship. Any opinions, findings, and conclusions or recommendations expressed above are those of the authors and do not necessarily reflect the views of the National Science Foundation or Sloan Foundation.